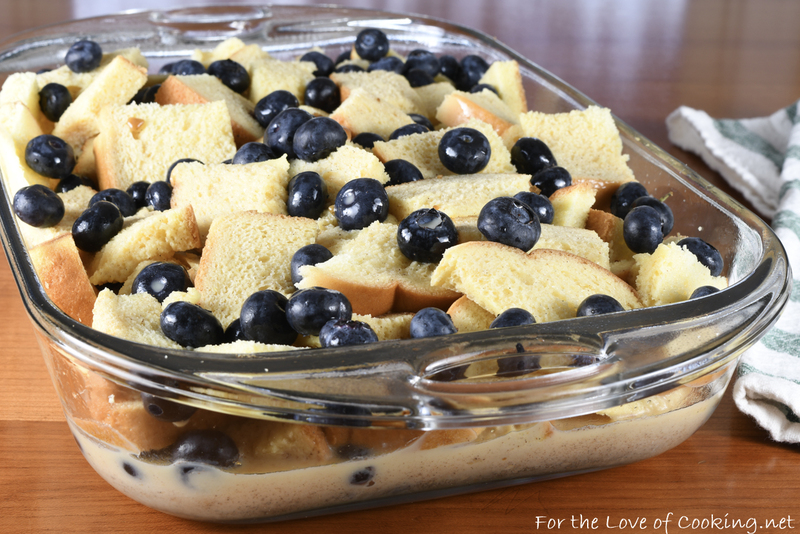 I surprised my family with this delicious blueberry French toast casserole last weekend and they were so happy. I found the recipe on Sally’s Baking Addiction and I made the recipe as written. Per instructions, I made this casserole the night prior to baking so it had plenty of time to soak up the liquids. The smells coming from the oven were drool worthy and we all couldn’t wait to dig in. 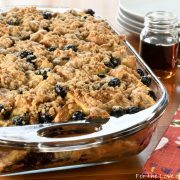 I served this blueberry French toast casserole with real maple syrup and extra fresh blueberries on the side for a decadent breakfast. We all thought it was delicious and my kids enjoyed the leftovers for breakfast the following morning before school. Prepare the casserole, by greasing a 9 x 13 inch pan with cooking spray. Cut the bread into cubes, about 1 inch in size. 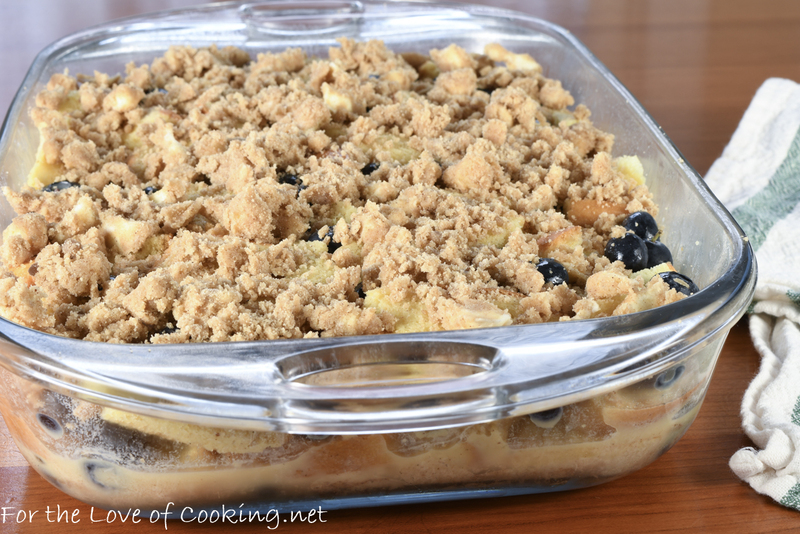 Spread half of the cubes into the prepared baking pan and top evenly with half of the blueberries. Add the remaining bread cubes followed by the remaining blueberries. Set aside. Whisk the eggs, milk, cinnamon, brown sugar, and vanilla together until very smooth. Pour evenly over the bread. Cover the pan very tightly with plastic wrap and place in the refrigerator for at least 3 hours – overnight. Overnight is best. Preheat oven to 350 degrees. Remove pan from the refrigerator and uncover. Prepare the topping, by whisking the brown sugar, flour, and cinnamon together in a medium bowl. Cut in the cubed butter with a pastry blender until crumbly. Sprinkle the topping evenly over the soaked bread. Bake for 50-60 minutes or until golden brown on top. Serve immediately. Cover the cooled leftovers tightly and store in the refrigerator for 2-3 days. Enjoy! Prepare the casserole, by greasing a 9 x 13 inch pan with cooking spray. Cut the bread into cubes, about 1 inch in size. Add the remaining bread cubes followed by the remaining blueberries. Set aside. Whisk the eggs, milk, brown sugar, cinnamon, and vanilla together until very smooth. Cover the pan very tightly with plastic wrap and place in the refrigerator for at least 3 hours - overnight. Overnight is best. Prepare the topping, by whisking the brown sugar, flour, and cinnamon together in a medium bowl. Cut in the cubed butter with a pastry blender until crumbly. Sprinkle the topping evenly over the soaked bread. Bake for 50-60 minutes or until golden brown on top. Serve immediately. Cover the cooled leftovers tightly and store in the refrigerator for 2-3 days. Enjoy! wow that looks amazing! 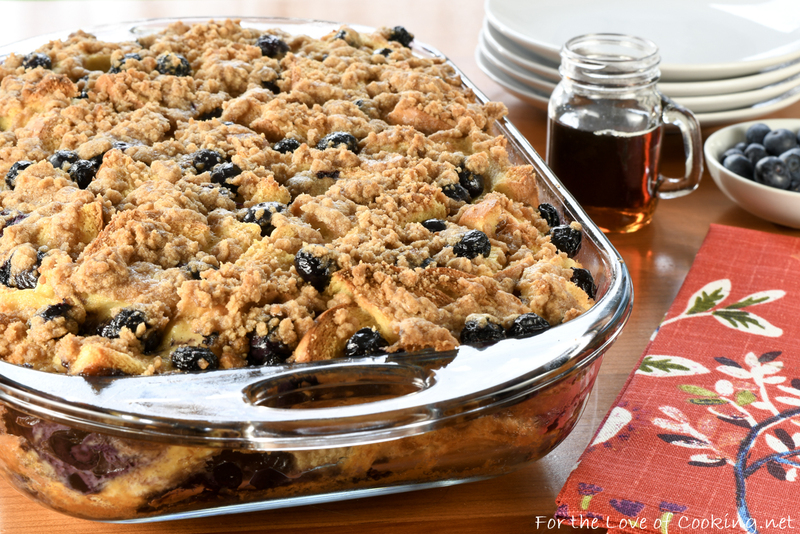 French toast alone is already great, then you added that streusel topping…totally irresistible! love blueberries and this looks delicious ! Looks delicious! Will try this weekend. How many eggs? Sorry! 8 large eggs. I have corrected the recipe. Just the name of this is nearly drool worthy. 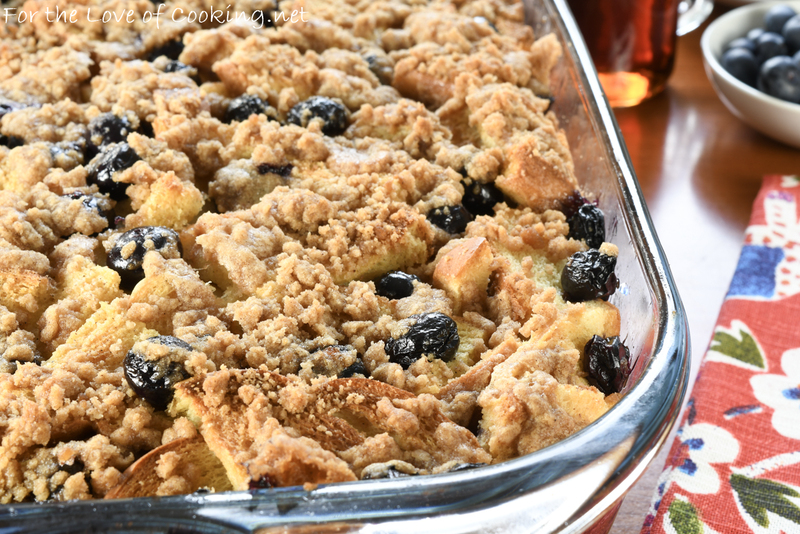 Bev likes French toast casseroles and I’m sure she’ll want to try this one. A very delicious way to make French Toast, indeed! Gorgeous picture also. PS I don’t see how many eggs are used in the ingredient list. Thanks for letting me know about the eggs – I have corrected the recipe. In the past when I tried to make a french toast casserole I found that all the egg settled at the bottom. Did you have this same issue? I am thinking maybe it was just the recipe that I used. This does look amazing and perfect for a weekend brunch. No, that didn’t happen to me. I whisked the eggs and milk together until VERY well combined then poured it over the bread. 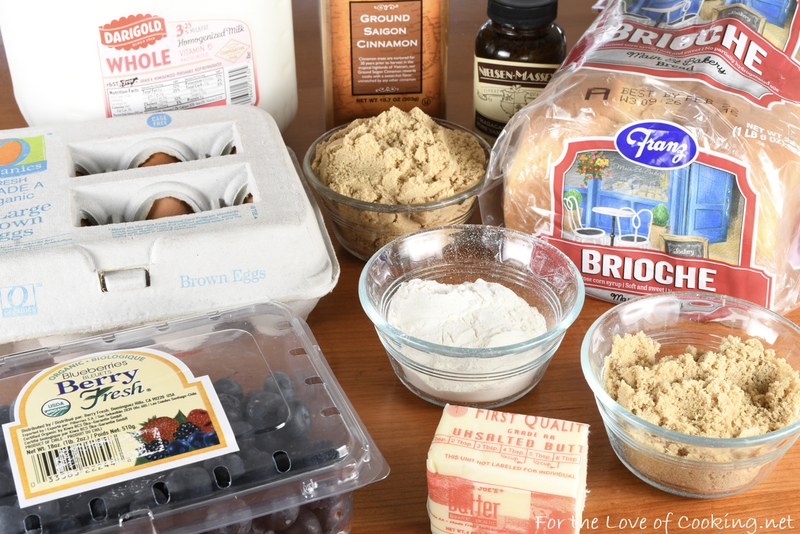 By the morning, all of the bread was soaked with the egg/milk mixture. It’s my birthday next weekend, which sounds like the PERFECT reason to make this!! Did you have an earlier version of this? I made some and loved it. However now the pic on Pinterest brings me to the one with strusel. The previous didn’t have.